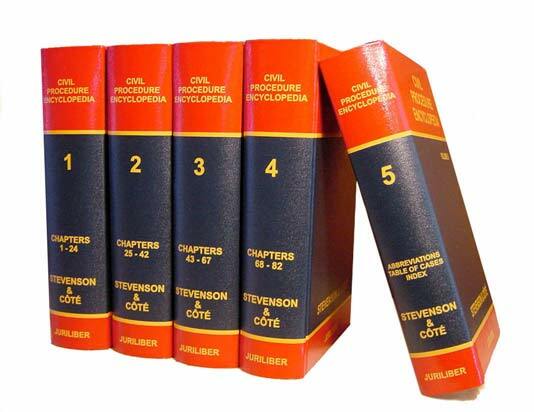 This work has evolved from the Civil Procedure Guide last published in 1996. It is not specific to any one province or rule but contains cases from all over common-law Canada (its provinces and territories) and England. It is the only Canadian text on civil procedure to achieve this. Decisions from the Supreme Court of Canada and Privy Council (on appeal from everywhere) are here, many not found elsewhere. Lists over 39,000 Canadian, British and Commonwealth judgments referencing 80,000 or more citations from texts, and articles published in those jurisdictions. The book achieves twin aims: a quick reference and data for research. 82 chapters in 5 volumes are arranged logically, topic by topic in a textbook format providing explanation and practical application of each topic. The authorities are relegated to footnotes. There is authority for and against many propositions in civil procedure. This book warns you which cases disagree and which seem questionable. Alternate citations for the same judgment are provided to help when only one database or set of reports is available. Often several different judgments have the same name; only parallel cites let you tell them apart. The Table of Cases allows instant access to a case on point providing full relevant discussion while naming other cases on the same topic. The style is terse with case citations grouped around propositions of law, not individual cases. A general and very detailed Table of Contents is found in each volume.